THE PROCESS…….starts with completing a questionnaire that helps to gather information and about your family to help us decide what type of puppy is best suited to your family. As the breeders we will select the puppy that we feel is best suited to your family. We attempt to match each of our puppy’s temperament and needs as closely as possible to the home they will eventually go to. We spend every day watching each puppy develop in stages and monitor their play behaviors, energy levels, and interaction with littermates and humans. This observation gives us the information to plan for each puppy placement in their forever homes. Answers to the questions gives us the information about what you are looking for in a puppy and what your family style/energy levels are. No two puppies are the same, each has their own personality, energy and needs, so determining which puppy matches your family is done with a great deal of care and insight, we have known this breed more than 40 years. After the questionnaire is completed we will contact you to let you know that your are approved and on The Puppy Waiting List. The Puppy Waiting List: is made from approved applicants. The breeding of a litter is posted on the web site as to who is the sire and the dam and the date the litter is due. We wait for the litter to be born (whelped) and as soon as it is we notify those families, that we have a puppy available for them. Deposits are now required, to reserve the puppy. ( DEPOSITS ARE NON-REFUNDABLE) All deposits and payments are in US dollars. The remaining balance of the agreed purchase price is due in cash or certified check on the day of delivery of the puppy. This picture is the 12 puppies, 6 males & 6 females born on April 04th, 2010. 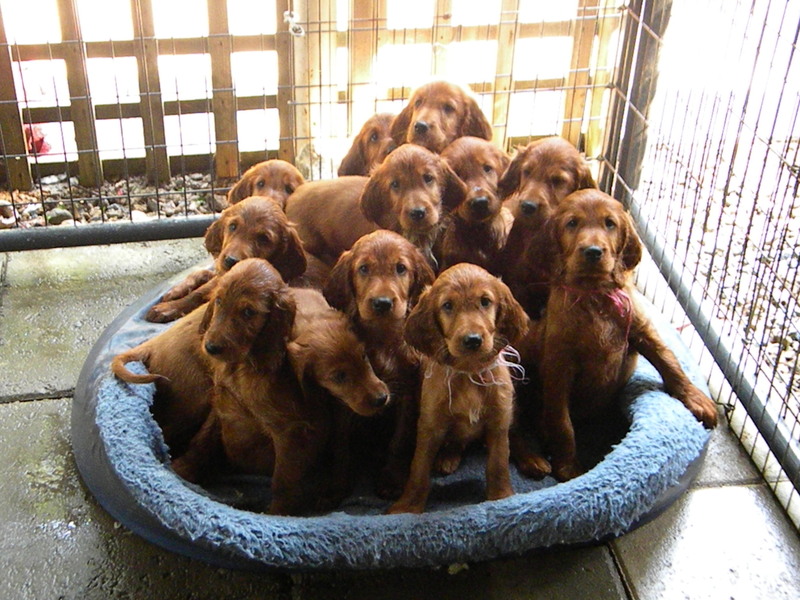 Erinshire Irish Setters would be pleased to send you our Personal and CONFIDENTIAL “Questionnaire: to Purchase A Puppy” Please email at erinshireirishsetters.com, this site has a contact page or at Bpierhal@aol.com and request an Application for Puppy Purchase in the subject line. We will respond as quickly as possible, via email and you can download the forms and instructions, and return them to us via email or for those who prefer regular mail. We feel that your private family information should not be public on a website, for this reason we would like you to proceed in confidence that your information will stay between only us. This application is for the purpose to gather information on your family structure and experience you have with dogs in general and specifically with the Irish Setter breed. If you have had an irish setter in the past then the application will be simple and if this is the first Irish Setter for your family, the application provides information about the health/training/feeding that is very important. As the breeders of these wonderful dogs, we ask potential owners to be sure this is the breed for you and a great deal of responsibility comes with ownership of any animal, and please do your research and be sure this is the right breed and the right time to bring a puppy to your lives. We make a commitment to be there for support for the life of the dog, and ask you to keep in contact and we will support you through the years . Please take the time to complete as much as possible the question portion of the application to help us get to know you and your family. Thank you in advance for your interest in our puppies and your trust in Erinshire Irish Setters. We look forward to working with you and your family and placing a puppy with you.